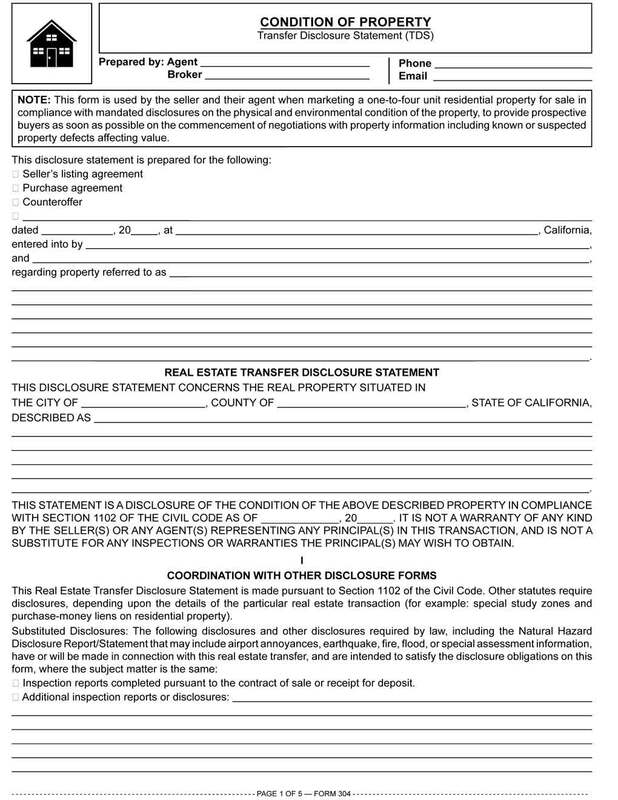 This form is used by the seller and their agent when marketing a one-to-four unit residential property for sale in compliance with mandated disclosures on the physical and environmental condition of the property, to provide prospective buyers as soon as possible on the commencement of negotiations with property information including known or suspected property defects affecting value. Editor’s note – A “condition of property” form does not exist for use in California which covers other than one-to-four unit residential property. However, RPI is in the process of producing a standardized condition of property disclosure form for the sale of other types of properties including commercial property later this year. When preparing the TDS, the seller sets forth any property defects known or suspected to exist by the seller. A property is always sold “as disclosed” in the TDS. Further, the time for delivery of the TDS to the potential buyer is mandated to occur before the seller accepts a purchase agreement offer submitted by a buyer — as soon as practicable (ASAP) after negotiations by the buyer begin. A buyer may only recover the cost to cure or loss of value resulting from an undisclosed and unknown defect that is observable by a reasonably competent broker during a visual on-site inspection. A seller’s agent conducting an inspection is expected to be as competent as the broker they represent. *Installation of a listed appliance, device, or amenity is not a precondition of sale or transfer of the dwelling. The carbon monoxide device, garage door opener, or child-resistant pool barrier may not be in compliance with the safety standards relating to, respectively, carbon monoxide device standards of Chapter 8 (commencing with Section 13260) of Part 2 of Division 12 of, automatic reversing device standards as set forth in Chapter 12.5 (commencing with Section 19890) of Part 3 of Division 13 of, or the pool safety standards of Article 2.5 (commencing with Section 115920) of Chapter 5 of Part 10 of Division 104 of, the Health and Safety Code. Window security bars may not have quick-release mechanisms in compliance with the 1995 edition of the California Building Standards Code. Section 1101.4 of the Civil Code requires all single family residences built on or before January 1, 1994, to be equipped with water-conserving plumbing fixtures after January 1, 2017. Additionally, on and after January 1, 2014, a single family residence built on or before January 1, 1994, that is altered or improved is required to be equipped with water-conserving plumbing fixtures as a condition of final approval. Fixtures in this dwelling may not comply with Section 1101.1 of the Civil Code. Form navigation page published 08-2015. Updated 08-2014. The Signature Section on page five has been restructured to better reflect the language of California Civil Code §1102 and allow more space for signatures.